Paddle Florida, 95+ FL Kayaking Destinations, E-Z Maps 1000s Photos. Welcome... Reports are organized into six (6) regions, all with regional maps = a great way to see where to paddle near you. Select a Region from the links below. You can also find individual reports listed alphabetically A-Z. 16 destinations. 450+ photos. Maps. Includes Blackwater River, Coldwater Creek. Chipola River and more. Some of the best paddling anywhere. Watch the seasons. 17 destinations. 450+ photos. Maps. Gulf to Atlantic, Cedar Key, Suwannee River, clear springs in the Ocala National Forest. Old Florida still exists here. 20 destinations. 650+ photos. Maps. Space Coast tidal creeks. Rivers, springs. See alligators, manatees, and more. 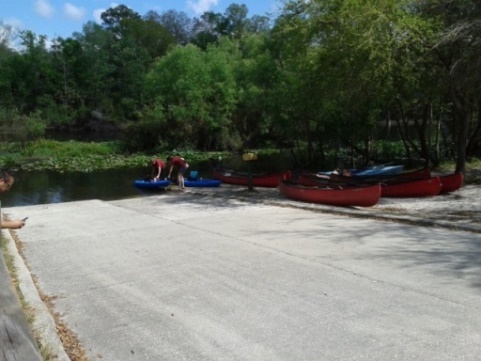 Find kayaking, eco-tourism near Disney. 18 destinations. 800+ photos. Maps. Tampa Bay preserves and coastal rivers. Look for manatee at springs near coast. More inland, some amazing wildlife viewing. 23 destinations. 500+ photos. Maps. Sanibel Island, Marco Island, Oleta State Park, the Everglades and more. Eco-tourism is big today. Maybe even find your beach. 4 destinations, 90+ photos. Maps. All with on-site rentals. Escape the wind, ideal for visitors. Discover some of the best sheltered kayaking in the Florida Keys. Alphabetical listing (A-Z). Over 95 reports with detailed Google maps, photos, launches, kayak, canoe rentals, and more. For paddlers by paddlers... With a temperate climate, over 1000 miles of coastline, and over 1700 miles of rivers, creeks, and spring runs, Florida is a paddlers paradise. As avid Florida recreational kayakers (sit-on-tops), we mostly enjoy comfortable half-day trips, ideal for most residents and Florida visitors. We seek nature, wildlife, exercise, and calm waters. In most cases, we avoid motorboats. Weather is important. We are not adventure seekers. No overnight camping. Over 95 destinations... See for yourself with detailed maps and photos. Browse in full privacy with no pop-ups and no sign-ins needed. We add and update regularly, so please come back often.